Houses & Homes VA: A $200 Dining Room that will Blow You Away! A $200 Dining Room that will Blow You Away! A dining room is a very important part of our home. It is where we gather with family and friends on the most important occasions and is the one room in our home that marks many of the milestones in our lives. Many of my fondest childhood memories evolve around that very special Thanksgiving dinner that was to be the last time that I would ever see my favorite aunt. Or that very special Christmas when everybody showed up for a visit! Yes, our dining rooms truly are (or should be) a very important part of our lives and for that reason should always look their best. Here are some easy and very affordable ways to upgrade your dining room for very little money. Surprise family and friends the next holiday season with an entire new look that anyone can afford and have a dining room that you can enjoy for years to come. There are 4 “secrets” to upgrading your dining room on a budget that will make a huge improvement. First you will need to declutter. The same as any other part of your home too much “stuff” where it doesn’t belong just doesn’t look good. A messy room also tends to lose its sense of purpose. Take the time to remove anything and everything that does not belong in a dining room. This alone will be a big improvement. Secondly, as I’ve said many times before, fresh paint can make a world of difference. 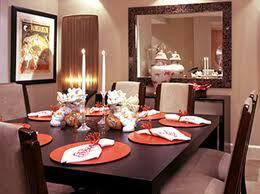 A dining room should be painted a color that is somewhat sophisticated. White is old school. If you’re on a very small budget you can paint just one wall to achieve an entirely different appearance. A different paint technique such as a color wash or suede effect is also very attractive. Fabrics are always the perfect enhancement and give the dining room a more intimate feel. New drapery and window panels can be found for around $75 at some retail stores. Hang the curtain rod very high on the wall and get a panel that is about a foot longer than you would usually buy. This adds a very elegant feel to the room very much like the décor in some of the better restaurants. Now it’s time to reupholster the seat cushions! There are real bargains to be found if you look for remnants and discontinued items at your local upholstery store. You will only need about ½ yard of fabric for each chair and reupholstering is very simple to do. If you have a chandelier you can spray paint it for about $5 to have a completely new look and if it is the type that has shades around the bulbs you can remove them to give a very “expensive” look to the room! Accessories are always important. If you don’t have a large framed mirror it’s time to get one. This will make the room appear larger and more spacious. Finally, be sure to use your best existing wine glasses and place settings when setting the table for guests and invest the remaining $20 or so in additional accessories. I suggest candles to complete your newly designed eating space. Now you have a beautiful and very elegant “new” dining room for under $200, just as promised!